Background: In sub-Saharan Africa (SSA), the trend in the number of patients admitted for maintenance hemodialysis is on the rise. The identification of risk factors for chronic kidney disease (CKD) ensures adequate primary and secondary preventive measures geared at reducing the burden of CKD in low-resource settings. A family history of CKD is an established risk factor for CKD in high-income countries. However, data on family predisposition to CKD is scarce in the literature on SSA. 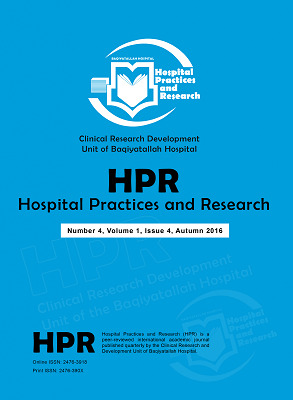 Objective: The current study aimed to determine the prevalence and risk factors of CKD in family relatives of a Cameroonian population of hemodialysis patients (HDP) followed-up in a major hemodialysis referral center in Cameroon. Methods: The current cross-sectional study was conducted over four months on a consecutive sample of first-degree family relatives of end-stage renal disease patients undergoing maintenance hemodialysis at the hemodialysis unit of the General Hospital of Yaoundé. For each participating family relative, socio-demographic characteristics, clinical data, and biological data including fasting blood glucose, proteinuria, and serum creatinine were collected. Results: A total of 82 first-degree family relatives of HDP were recruited. The prevalence of CKD among the participants was 15.8%. The main identified risk factors for CKD were age (P=0.0015), female gender (P=0.0357), hypertension (P=0.0004), regular intake of herbal remedies (P=0.0214), and diabetes mellitus (P=0.0019). Conclusion: Overall, the current findings suggest an urgent need for population education, routine screening of CKD, and the identification of risk factors in first-degree family relatives of HDP in Cameroon. Hill NR, Fatoba ST, Oke JL, et al. Global Prevalence of Chronic Kidney Disease - A Systematic Review and Meta-Analysis. PLoS One. 2016;11(7):e0158765. doi:10.1371/journal.pone.0158765. Baumgarten M, Gehr T. Chronic kidney disease: detection and evaluation. Am Fam Physician. 2011;84(10):1138-1148. Bello AK, Nwankwo E, El Nahas AM. Prevention of chronic kidney disease: a global challenge. Kidney Int Suppl. 2005(98):S11-17. doi:10.1111/j.1523-1755.2005.09802.x. National Kidney and Urologic Diseases Information Clearinghouse (NKUDIC)/National Institutes of Health (NIH). Kidney disease statistics for the United States. NIH Publication; 2012. Bakris GL, Ritz E. The message for World Kidney Day 2009: hypertension and kidney disease--a marriage that should be prevented. J Hypertens. 2009;27(3):666-669. doi:10.1097/HJH.0b013e328327706a. El Matri A, EAM Elhassan, Abu-Aisha H. Renal replacement therapy resources in Africa. Arab J Nephrol Transplant. 2008;1(1):9-14. doi:10.4314/ajnt.v1i1.58814. Mosima E. Cameroon: “More Dialysis Centres Have Facilitated Treatment”. allAfrica.com website. http://allafrica.com/stories/201601060720.html. Accessed June 30, 2018. Ozer Etik D, Ocal S, Boyacioglu AS. Hepatitis C infection in hemodialysis patients: A review. World J Hepatol. 2015;7(6):885-895. doi:10.4254/wjh.v7.i6.885. Khan YH, Sarriff A, Adnan AS, Khan AH, Mallhi TH. Blood Pressure and Mortality in Hemodialysis Patients: A Systematic Review of an Ongoing Debate. Ther Apher Dial. 2016;20(5):453-461. doi:10.1111/1744-9987.12406. Definition, Classification, and Prognosis in CKD. KDIGO. http://kdigo.org/home/conferences/definition-classification-and-prognosis-in-ckd-2009/. Accessed June 30, 2018. Levey AS, Atkins R, Coresh J, et al. Chronic kidney disease as a global public health problem: approaches and initiatives - a position statement from Kidney Disease Improving Global Outcomes. Kidney Int. 2007;72(3):247-259. doi:10.1038/sj.ki.5002343. Levin A, Stevens PE, Bilous RW, et al. Kidney disease: Improving global outcomes (KDIGO) CKD work group. KDIGO 2012 clinical practice guideline for the evaluation and management of chronic kidney disease. Kidney Int Suppl. 2013;3(1):1-150. doi:10.1038/kisup.2012.73. Bello AK, Peters J, Wight J, de Zeeuw D, El Nahas M. A population-based screening for microalbuminuria among relatives of CKD patients: the Kidney Evaluation and Awareness Program in Sheffield (KEAPS). Am J Kidney Dis. 2008;52(3):434- 443. doi:10.1053/j.ajkd.2007.12.034. Bergman S, Key BO, Kirk KA, Warnock DG, Rostant SG. Kidney disease in the first-degree relatives of African-Americans with hypertensive end-stage renal disease. Am J Kidney Dis. 1996;27(3):341-346. doi:10.1016/S0272-6386(96)90356-X. Brown WW, Peters RM, Ohmit SE, et al. Early detection of kidney disease in community settings: the Kidney Early Evaluation Program (KEEP). Am J Kidney Dis. 2003;42(1):22- 35. doi:10.1016/S0272-6386(03)00405-0. O’Dea DF, Murphy SW, Hefferton D, Parfrey PS. Higher risk for renal failure in first-degree relatives of white patients with end-stage renal disease: a population-based study. Am J Kidney Dis. 1998;32(5):794-801. doi:10.1016/S0272-6386(98)70135-0. Tianyi FL, Tochie JN, Agbor VN, Kadia BM. Audit of HIV counselling and testing services among primary healthcare facilities in Cameroon: a protocol for a multicentre national cross-sectional study. BMJ Open. 2018;8(3):e020611. doi:10.1136/bmjopen-2017-020611. Njigou AR, Tochie JN, Danwang C, et al. Seroprevalence of Hepatitis B and C Infections in Mokolo District Hospital, Northern Cameroon: The Value of a Screening Campaign. Hosp Pract Res. 2018;3(3):79-84. doi:10.15171/hpr.2018.18. Ayodele OE, Salako BL, Kadiri S, Arije A, Alebiosu CO. Hepatitis B virus infection: implications in chronic kidney disease, dialysis and transplantation. Afr J Med Med Sci. 2006;35(2):111-119. Stanifer JW, Jing B, Tolan S, et al. The epidemiology of chronic kidney disease in sub-Saharan Africa: a systematic review and meta-analysis. Lancet Glob Health. 2014;2(3):e174-181. doi:10.1016/S2214-109X(14)70002-6. Stanifer JW, Lunyera J, Boyd D, et al. Traditional medicine practices among community members with chronic kidney disease in northern Tanzania: an ethnomedical survey. BMC Nephrol. 2015;16:170. doi:10.1186/s12882-015-0161-y. Eng J. Sample size estimation: how many individuals should be studied? Radiology. 2003;227(2):309-313. doi:10.1148/radiol.2272012051. Estimating Glomerular Filtration Rate (GFR): National Institute of Diabetes and Digestive and Kidney Diseases (NIDDK). [cited 2018 Jun 30]. Available from: https://www.niddk.nih.gov/ health-information/health-communication-programs/nkdep/lab-evaluation/gfr/estimating/Pages/estimating.aspx. Accessed June 30, 2018. OMS. Diabète. http://www.who.int/mediacentre/factsheets/fs312/fr/. Accessed June 30, 2018. Arterial Hypertension (Management of). https://www.escardio.org/Guidelines/Clinical-Practice-Guidelines/Arterial-Hypertension-Management-of. Accessed June 30, 2018. Reiner Z, Catapano AL, De Backer G, et al. ESC/EAS Guidelines for the management of dyslipidaemias: the Task Force for the management of dyslipidaemias of the European Society of Cardiology (ESC) and the European Atherosclerosis Society (EAS). Eur Heart J. 2011;32(14):1769-1818. doi:10.1093/eurheartj/ehr158. Tonelli M, Riella M. Chronic kidney disease and the aging population. Indian J Nephrol. 2014;24(2):71-74. doi:10.4103/0971-4065.127881. O’Hare AM, Choi AI, Bertenthal D, et al. Age affects outcomes in chronic kidney disease. J Am Soc Nephrol. 2007;18(10):2758- 2765. doi:10.1681/ASN.2007040422. Zhang L, Wang F, Wang L, et al. Prevalence of chronic kidney disease in China: a cross-sectional survey. Lancet. 2012;379(9818):815-822. doi:10.1016/S0140-6736(12)60033-6. Iseki K. Gender differences in chronic kidney disease. Kidney Int. 2008;74(4):415-417. doi:10.1038/ki.2008.261. Silbiger SR, Neugarten J. The impact of gender on the progression of chronic renal disease. Am J Kidney Dis. 1995;25(4):515-533. doi:10.1016/0272-6386(95)90119-1. Judd E, Calhoun DA. Management of hypertension in CKD: beyond the guidelines. Adv Chronic Kidney Dis. 2015;22(2):116-122. doi:10.1053/j.ackd.2014.12.001. Tedla FM, Brar A, Browne R, Brown C. Hypertension in chronic kidney disease: navigating the evidence. Int J Hypertens. 2011;2011:132405. doi:10.4061/2011/132405. Kingue S, Ngoe CN, Menanga AP, et al. Prevalence and Risk Factors of Hypertension in Urban Areas of Cameroon: A Nationwide Population-Based Cross-Sectional Study. J Clin Hypertens (Greenwich). 2015;17(10):819-824. doi:10.1111/jch.12604. Inserra F, de la Llave G, Alpino M, et al. [Survey of risk factors and renal disease in first-degree relatives of dialysis patients]. Medicina (B Aires). 2007;67(1):8-18. Cavanaugh KL. Diabetes management issues for patients with chronic kidney disease. Clin Diabetes. 2007;25(3):90-97. doi:10.2337/diaclin.25.3.90. Mbanya JC, Motala AA, Sobngwi E, Assah FK, Enoru ST. Diabetes in sub-Saharan Africa. Lancet. 2010;375(9733):2254- 2266. doi:10.1016/S0140-6736(10)60550-8. Jha V. Herbal medicines and chronic kidney disease. Nephrology (Carlton). 2010;15 Suppl 2:10-17. doi:10.1111/j.1440-1797.2010.01305.x. Hsieh CF, Huang SL, Chen CL, et al. Increased risk of chronic kidney disease among users of non-prescribed Chinese herbal medicine in Taiwan. Prev Med. 2012;55(2):155-159. doi:10.1016/j.ypmed.2012.06.003. Regulation of Traditional Medicine in the WHO African Region. African Health Observatory. https://www.aho.afro.who.int/en/ahm/issue/13/reports/regulation-traditional-medicine-who-african-region. Accessed June 30, 2018.